The demand in security made the engineers to develop more intelligent electronic equipments which could be used in the day to day life process. RFID(Radio Frequency Identification) is a high end secured device which can be applied in any area where security is inevitable. RFID is the wireless use of electromagnetic fields to transfer data, for the purposes of automatically identifying and tracking tags attached to objects. The tags contain electronically stored information which is transferred to the reader in wireless manner. The rhydoLABZ RFID reader reads EM4100 family transponder tags that are brought in proximity to the reader and output the unique tag identification number through serial port @9600 bps. The reader output is 12 byte including one start, stop byte and 10 unique data byte. The normal detection range is 10-15CM for Card Type TAGs. The RFID Reader (as well as the RFID tags sold by rhydoLABZ) uses the EM4102 protocol. Any other tags that also use the EM4102 protocol can be used with the rhydoLABZ RFID reader. Based on the unique Id of each card, it can be discriminated after receiving the suitable data serially. To develop a highly advanced security system RFID module is interfaced with Raspberry Pi2. As the Raspberry pi can perform face recognition, both the process can be clubbed ie the authentication must be only given by obtaining the satisfied outputs from RFID and image processing. Connect the 5V pin(pin No 2) and ground(pin No 6) of the Raspberry Pi to the 5V and ground pin of the RFID module. As the data transmission is taking place in the RFID connect the Tx pin of the RFID to the Rx pin(pin No 10) of the Raspberry Pi. The power led will become on after the connections. 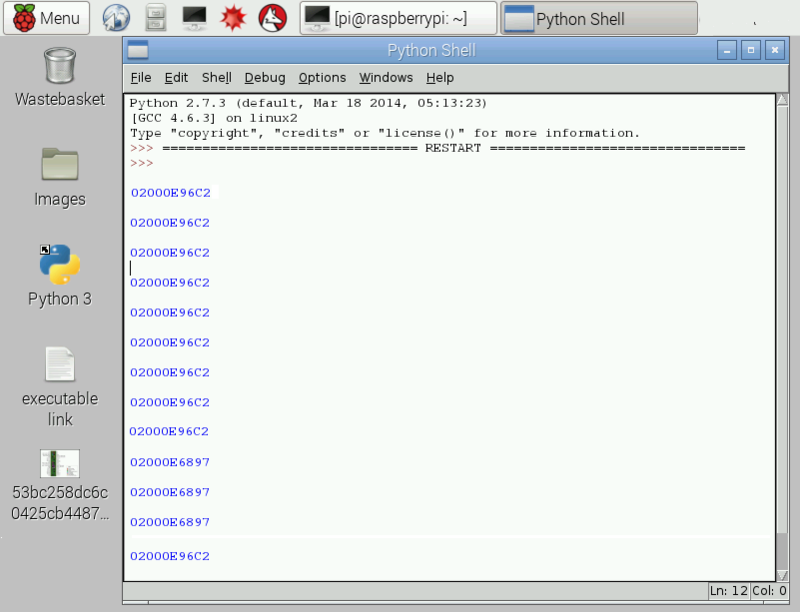 Using Pyrhon script read the serial data and display the output on the Python shell. A sample code is provided for reading the RFID using Python. After running this code place the tag near to the reader and get the data on the Python shell. After checking the corresponding ID each cards could be discriminated and then applied for any secured purposes. Click here to buy Raspberry Pi 2 from RhydoLabz. Click here to buy RFID Clamshell Card from RhydoLabz. 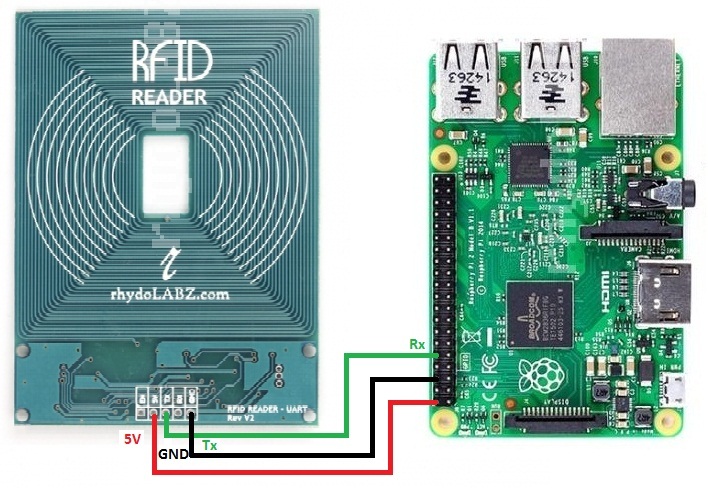 8 Responses to "RhydoLabz RFID Reader (125Khz) – Serial TTL Interfaced with Raspberry Pi2"
The error occurs due to the incorrect syntax. As there is no end command in python, the code written below the loop(while, for & if) should be properly aligned. In this code, after typing len(rcv)> 1:, press the enter key, so that the curser will persist in the correct position. after that copy the other line of codes. Repeat the same for other loops also. I would think that this will kill the Raspberry PI’s UART. It is designed for 3.3V, not for 5V. after this line (if len(rcv) > 1:) press the enter key and then enter the next line….